Getting great exercise equipment for your home gym doesn’t have to cost an arm and a leg. With a sound understanding of the different types of exercise equipment available to you, it’s easy to get yourself looking and feeling great, while also keeping your bank account in good shape. In this article, we discuss the best upper body workout equipment you can get for under $200. Training your upper body is extremely important for many reasons. A strong upper body helps you better tackle the demands of daily life: You can lift and carry heavier things more easily, better support and manoeuvre your own bodyweight, complete manual labor for longer, and most importantly, unscrew the lids from stubborn jars without having to bang them on the kitchen counter or run them under hot water. Research in sport and exercise science has also shown that upper body workouts elicit a more intense physiological response than lower body workouts, especially in the cardiovascular and respiratory systems. This means that upper body exercises appear to place significant strain on the heart, lungs and blood vessels (in a good way) and lead to greater positive adaptations in these organs compared to lower body exercises. That said, you’ll likely get just as much overall benefit from lower body workouts, and you definitely shouldn’t skip leg day; the point is simply that upper body workouts are intense and highly beneficial to the functioning of the important stuff inside your body. 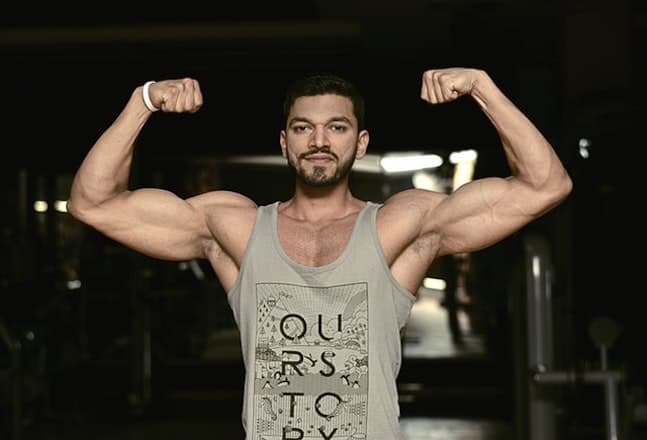 The benefit of upper body workouts has been reinforced by medical researchers who have consistently shown that developing strength and muscle in the upper body makes you healthier and more likely to live a long life. For example, a recent meta-analysis* that examined data from over 2,000,000 people found that developing upper body strength was strongly linked with a decreased risk of dying prematurely (from any cause). Finally, if you’re on the market for a life or sexual partner, then taking care of your upper body will put you in good stead. Research into perceptions of attractiveness have consistently found that a lean and strong upper body is rated as high in attractiveness by others, irrespective of gender or sexuality. Moreover, having an attractive body has been found to result in better chances of finding a partner, especially for men (less so for women). Yes, we’ve gone a long way to make a short point: Upper body workouts have a lot of benefits and can be done at very low cost, and therefore should not be undervalued. Plus, you don’t need any special equipment to perform high-quality upper body exercises – some open space and your own bodyweight is enough. That said, some key pieces of equipment will help you make the most of the time you dedicate to this worthwhile endeavor. Free weights broadly include any freely moving object(s) that provides the resistance for strength training. Dumbbells and barbells are the most common and recognizable examples of free weights, but kettlebells, sandbags, medicine balls and slam balls, and even your own bodyweight come under this banner. As far as equipment for training your upper body goes, few offer the effectiveness and adaptability of free weights. You can create and complete a massive number of exercises to work just about every muscle in your body. Any sport- or life-specific movement you want to train can be replicated with free weights to add resistance and build your capacity to complete that movement. Free weights can also be used solely for strength building, or incorporated into cardio workouts to add extra challenge. Indeed, the range of exercises you can do with free weights is limited only by your current physical ability and your imagination. They can easily train large portions of the body at once. Free weights readily lend themselves to compound movements involving multiple large muscle groups, both as prime movers (e.g., the quads, glutes and hamstrings during a squat) and as stabilizers (e.g., core muscles during a squat). This makes free weights extremely efficient pieces of equipment. This is very much the point of the article, right? 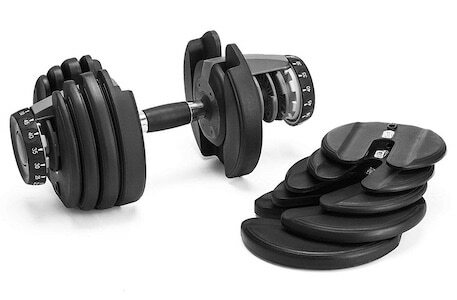 For under $200 you can pick up a set of dumbbells, or even a barbell that provides huge room for physical development. If you so desire, this is all the exercise equipment you really need to get and stay fit, strong, and healthy. People who lack experience or confidence in their physical ability can find the thought of using free weights overwhelming, especially in the case of more advanced pieces of equipment like Olympic barbells. This tends to lead to apprehension and avoidance, and a failure to utilize free weights to their fullest extent. They can easily cause injury if used improperly. This is often related to the above point. If used improperly by people who are inexperienced or have not been taught correct technique, free weights can lead to serious injuries. Strained muscles, tendons and ligaments are not uncommon results of using free weights with poor form and/or too much weight It extends beyond improper use too. 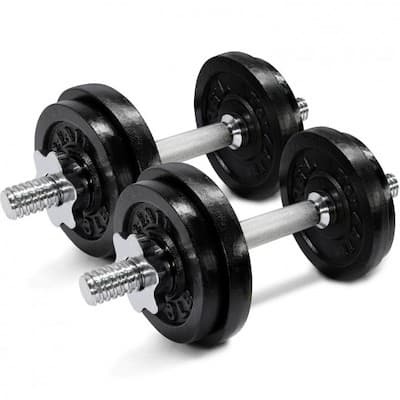 Free weights are easily dropped, and can cause crush injuries to hands, legs and feet in particular. All in all, the advantages outweigh the disadvantages, and make free weights one of the best options for supercharging your upper body workouts. Here are some of the top free weights you can pick up, all for less than a couple of Benjamins. If you’re serious about shaping up your upper body, free weights are a must-have. 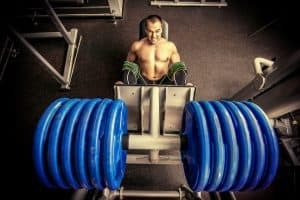 If you’ve been looking at dumbbells already, then you’ve probably noticed how expensive a good amount of weight can be. That’s a huge reason why the Yes4All Adjustable Dumbbells caught our eye. You can get up to a whopping 200 pounds, for under 200 bucks: a price practically unheard of for that weight. Something great about this model, is that it grows as you do. If you’re not ready to be curling 100 pounds, you can start all the way at 2.5 pounds on each side. You’ll receive sixteen 10lb. plates, four 5lb. plates, and four 2.5lb. plates so you have quite a bit of variation. Despite being so affordable, the set is made of durable cast iron plates that are rust-and-corrosion-resistant. 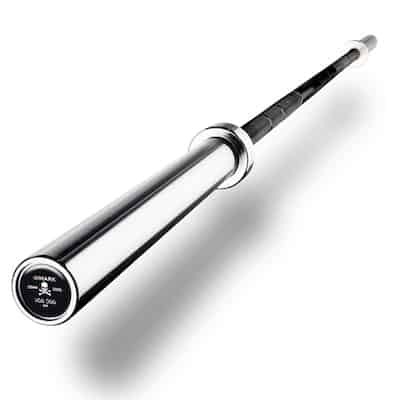 The 16-inch diamond knurled chrome handles are just as sturdy, ensuring you have a solid grip while lifting. To store, simply remove the star-lock collars, take off the plates, and stow away. Assembly is just as quick and easy, and the collars stay on securely, so you can lift with confidence and without worry. There are a couple potential downsides, however. First, is that if you drop the dumbbells, the plates may get damaged, so it’s important to place them down smoothly when you’re finished with your set. Next, is that they can roll away if placed on a floor if it’s not perfectly even. 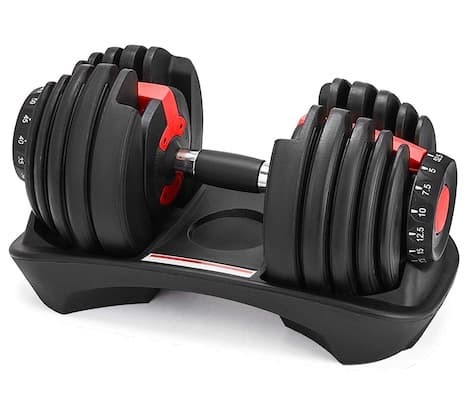 If 200 pounds is a bit too much for your goals, then you may want to give the Popsport Adjustable Dumbbell Series a go. This package comes with one dumbbell, with weights being adjustable anywhere from 5 pounds to 52.5 in 2.5-pound increments. Adjustment is a bit easier than with the Yes4Alls, as all you have to do is turn the dial to change resistance rather than taking off the collar and weights. The benefit here is not just convenience, but making switching different exercises easy. For example, you’re probably going to use much lighter weight to perform lateral raises than bench presses. For more efficient workouts, you’ll want to minimize rest time between exercises, which is where the Popsport dumbbells really shine. If you’re worried about durability, there’s no need to. The premium steel plates are not only extra-sturdy, but are also resistant to erosion. The nylon base and handles are also very dense and durable. While we would’ve preferred steel handles, these work okay. To keep plates from falling off, rather than a collar, you have safety interlock catches so all you have to focus on is your workout. While this is a great bargain, keep in mind that you do have only one. You can still get a complete workout done with a single dumbbell, but if you want two you’ll obviously have to purchase a second one. They do come in pairs, which knocks about $50 off the second, but puts the total cost over $200. If you’re serious about getting started with your home gym, a barbell is the way to go. Barbells are not only great for upper body exercises like presses, curls, and rows, but also lower body exercises like squats and deadlifts. 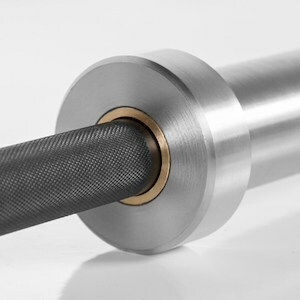 One of the best on the market today is the XMark Voodoo 7′ Olympic Bar. With a superior tensile strength of 185,000 PSI and a 1500lb. weight capacity, we have a feeling you’ll be able to use this bar for years and years to come. Heat treated alloy steel ensures that it can take whatever you (hopefully not literally) throw at it, and is perfect for beginners just as well as power lifters. The black manganese phosphate shaft will also help to protect against corrosion and abrasion. While it’s not coated in chrome, it’s still a very solid product, and the bushings are just as high-quality. The bar weighs 20kg on its own, so if you’re just starting out or don’t have a lot of strength, you’ll be able to really get a quality upper body workout right out of the gate. However, if you’re stronger or feel that you’re going to gain strength quickly, then you’ll want to add on some weight plates. The real downside comes with the warranty, however. You’d think that with such a staple like an Olympic bar, that they’d have at minimum, a 1-year warranty. Nope; try 90 days against bending. That’s pretty skimpy, if you ask us. Remember when we mentioned tossing in some weight plates? 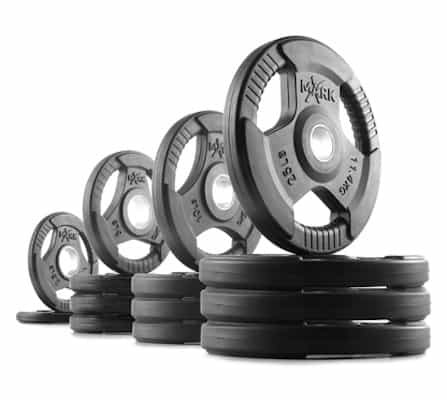 Here’s our recommendations: the XMark Tri-Grip Plate Weights. As they’re the same brand as our last product, they work perfectly together. Your options vary quite a bit here, and you can select just about anything from a pair of 10lb. plates to complete sets up to 350 lbs. Each plate is a handcrafted, single-piece design made from sturdy cast iron. The premium rubber casing consists of both virgin and recycled rubber to protect each plate, as well as your hands. The recessed tri-grip handles are a nice addition, making it easy to carry them, but also to use them on their own for exercises like front raises, overhead presses, and Russian twists, among others. For simple loading/offloading, they’ve also thoughtfully included finger slots. No more getting fingers pinched! While they’re just about as quiet to use as bumper plates, they’re not meant to be abused and dropped like them. 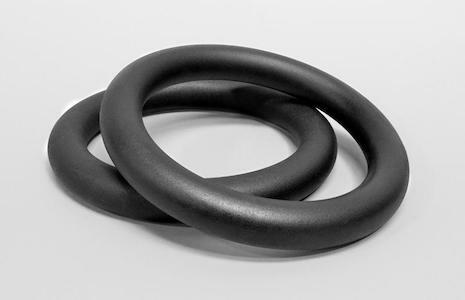 The rubber covers are meant to keep them looking their best and to prevent corrosion, but dropping them regularly will surely crack them. Really the only thing you might want to be aware of, is the odor that the plates emanate. However, it’s typical for plates to have a light oil film on them, and that, along with the rubber smell dissipates quickly. Making gains in strength, muscle, endurance, flexibility, or general fitness requires hard work and dedication – there’s no getting around it. This is no more true than when working out using just your own bodyweight. Bodyweight training (also known as ‘calisthenics’) is a fantastic way to develop your upper body, but it’s a long process and is often accompanied by periods of stagnation and frustration. But, the reward can be huge. Anyone who has completed long-term, dedicated bodyweight training knows how rewarding it can be. The muscular size, strength, power, and endurance you can achieve through calisthenics is extraordinary. Indeed, the human body’s capacity for movement and ability to defy gravity borders on the phenomenal. The skills that can be learned from bodyweight training, such as muscle ups, front and back levers, planches, and even simple handstands are not only visually impressive, but also functional. Being able to easily lift and manipulate your bodyweight is a very useful skill and, similar to training with free weights, makes physically navigating through life nearly effortless. 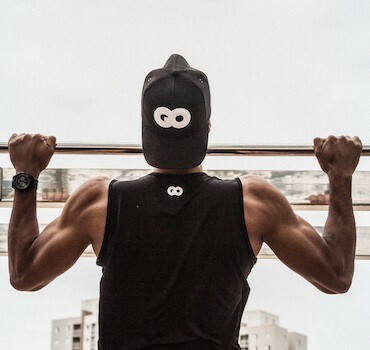 While weights definitely have their place in a fully-rounded fitness routine, if you’re looking for the best upper body exercise, we can confidently say it’s the pull up. The pull up works not only the erector spinae muscles and lats, but just about every muscle in the upper body. That being said, a good pull up bar is worth its weight in gold. You’ve probably laughed at various YouTube videos of people’s doorway pull up bars coming loose, but this one is made to stay in place. You will have to install it on a wall, however, the system makes it a straightforward process and will take around half an hour if you have a stud finder, drill, ratchet set, and screwdriver handy. The bar is made for 8-10 foot ceilings, but you can set it to be either 14 inches or 22 inches from the wall or ceiling – whatever works best for you. The 23-pound bar can hold up to 600 pounds, so you don’t have to be concerned about it falling off or bending or anything like that. The 14-gauge steel design is made to last, and you can use it in your home just as well as outdoors. If we were to define the second best upper body exercise, it would have to be the dip. It helps strengthen your grip, your forearm muscles, chest, shoulders, triceps, and more. We can’t emphasize just how important body weight exercises are to a healthy body and developing real strength and definition. However, it’s difficult to find a good dip bar. 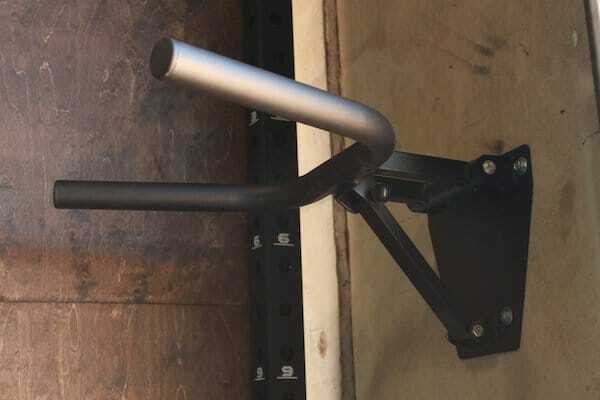 Luckily, the Fringe Sport Foldable Wall-Mount Dip Bar exists. 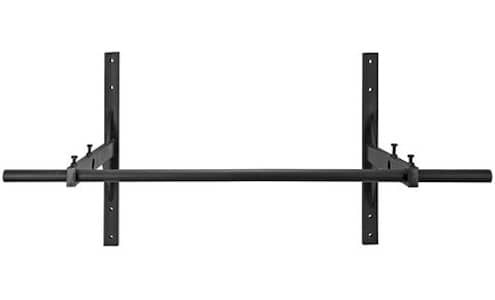 Much like the pull up bar, you attach it to the wall securely to make sure it stays in place. The tapered design makes it great for progression, as well as working out different muscle groups. You can go for a more narrow grip closer to the wall, or a wider grip further away from it. As you’re going to literally have bars sticking out of your wall, you want to ensure no one accidentally runs into it. It’s helpful to know that it can be folded either up or down to stow when not in use, while a pin secures it in place when retracted. If you want great bang for your buck, keep reading. Power towers combine pull up bars, dip bars, knee raise station (for your abs and other core muscles) and often push up platforms into a single piece of equipment. This makes them extremely versatile, but also more expensive and requiring of more space in your home gym. The XMark Power Tower has just about everything you need for your upper body. While it’s not the best of the best, for under 200 bucks, it will take you pretty far. 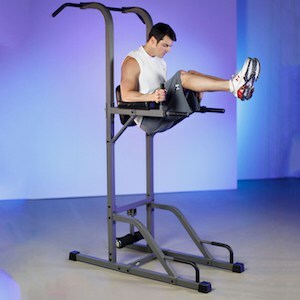 The knee raise/captain’s chair station allows you to work out the entire length of your abdominals and obliques with ease. 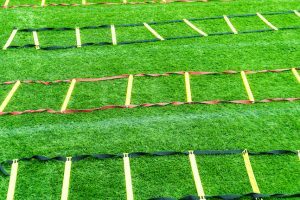 The push-up area makes sure you have grips to hold on to, rather than the dirty ground, and the sit-up area features large, 4-inch roller pads for your feet to hold you in place. The dip and pull-up stations we already covered above, so we won’t go into that. The unit is made with 14-gauge steel construction with scratch-resistant powder coat finish to keep it looking its best. 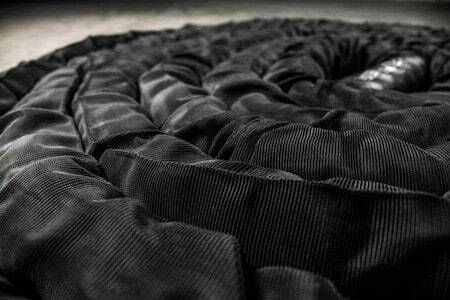 The back consists of an extra-thick, 2.5-inch, high-density cushion with double-stitched, tear-resistant duraguard vinyl so there’s no chance of discomfort or tearing. 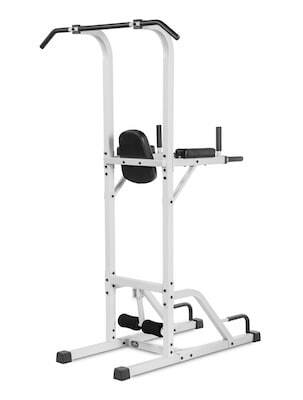 This tower will hold up for countless workouts, and although it may not be quite as stable as a wall-mounted bar, it does the job well. 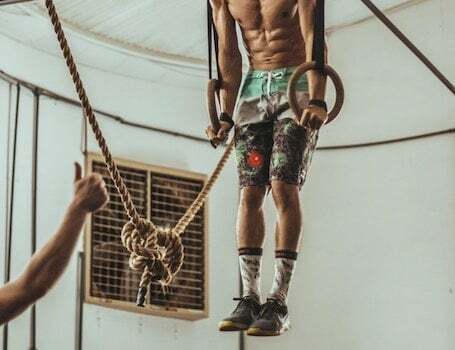 Gymnastics rings and suspension trainers are a subset of bodyweight training equipment that utilize an ‘unstable surface’ and provide an extra degree of difficulty to typical upper body exercises. Among sport and exercise scientists, it’s been suggested that training on unstable surfaces places greater stress on the neuromuscular system than regular exercise training, and can produce significant, incremental improvements in strength, power, balance, and core stability, as well as improve the strength of joints and reduce injuries. Research has found partial support for these claims. A full exploration of that research is beyond the scope of this article, but you can find some great info in this study and this meta-analysis. 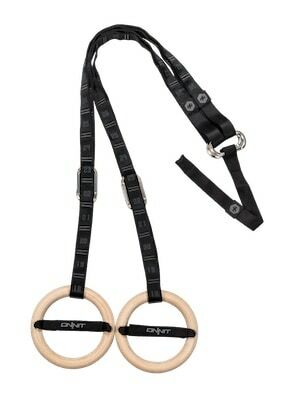 Below are our top picks for great gymnastics rings and suspension trainers. If you’ve ever taken a look at gymnasts, you’ll know they’re in insane shape. A huge part of that is due to working with rings, which works to train various muscle groups but also tone through fat loss. 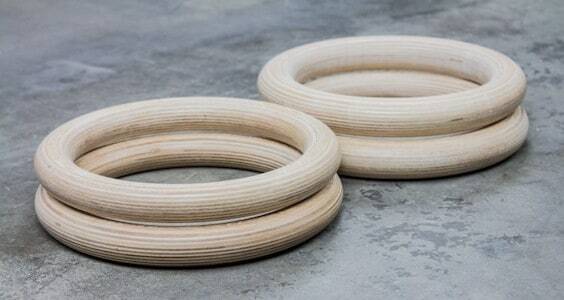 Gymnastics rings may not look like much, but we’re willing to bet they’re the hardest to use on this list. What’s great about them, is they’re easily portable, lightweight, and simple to set up. If you’re more focused on overall core and upper body strength than gaining muscle, or if you just want to increase stamina, this is an excellent option. The 1.5″ wide numbered straps make it easy to put together and adjust height at a moment’s notice. Velcro retention loops make sure to keep the excess neat-looking, while also ensuring safety during exercise. The cam buckles never slip under load, and both rings and straps can handle up to 600 pounds, so you can feel confident using them. Made of natural Baltic birch wood, they’re just like those used in professional competitions. The 1.1″ diameter works well if you have smaller hands and have trouble using the 1.25″ rings. This ensures a solid grip too. Keep in mind that if you’re just starting out in your fitness journey, rings may be difficult to get the hang of and use them efficiently. You’ll need a good base fitness level to really reap the full benefits, but don’t let that stop you from trying them out. While the Rep Fitness rings are an excellent product, they’re not going to be ideal if you’re training outdoors. Wooden equipment can get waterlogged, rendering them essentially useless. They just don’t hold up well in the elements. 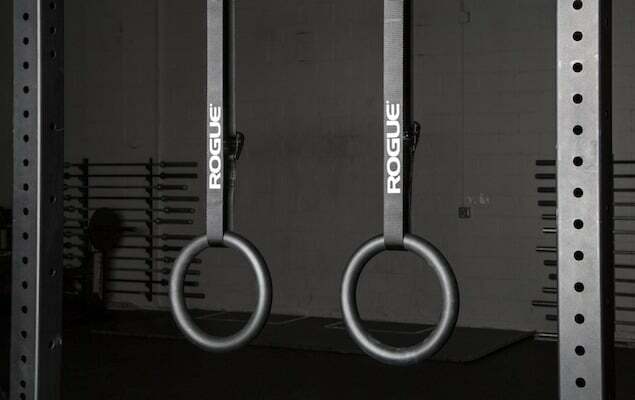 The best alternative, would be the Rogue Gymnastic Rings. Rogue is a top-quality exercise equipment manufacturer, and became well-known because of this product. At first glance, these are some attractive rings. 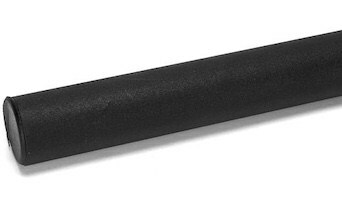 The matte black, 1.25″ 14-Gauge Steel tubing is completely TIG welded by hand, and powder-coated to prevent rust and scratches. The zinc phosphate plating underneath aids with this, and the exterior coat ensures you have a solid yet comfortable grip. The straps come in either black, silver, or gold; all of which look incredible paired with the rings. Straps and buckles are all made to hold up to rough workouts and rough weather, and are easy to adjust so you can complete intricate workouts in a timely manner. Just make sure that you keep an eye on them if you’re using them in public, because they’re sure to turn some heads! 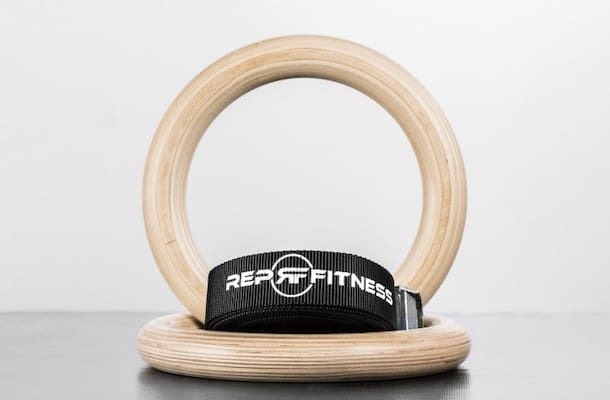 We would recommend these rings for those who already have some experience in this area, as it does take quite a bit of core strength and upper body strength to use them effectively. If you’re just starting out with suspension work, the TRX or the ONNIT systems would be a great option. Getting into suspension training like rings can be difficult. 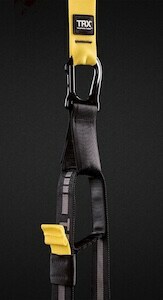 If you want to work your way into it, check out the TRX All-In-One Suspension Training System. Use it indoors or outdoors – wherever you’d like! 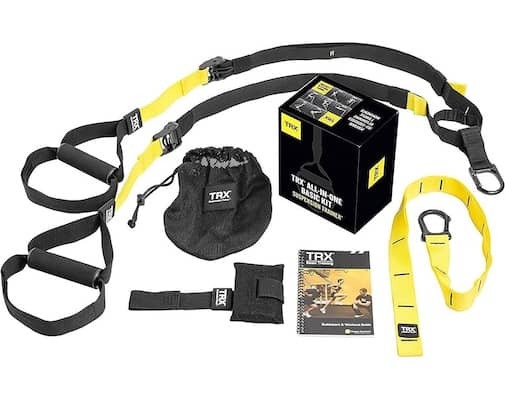 While there are plenty of suspension training kits out there, nothing can compare to TRX. Easily hook it up to doors, rafters or beams at home, at the park, trees, poles, it doesn’t matter. Set up shouldn’t take more than a couple of minutes, and even if you’ve never used a suspension system before, you’ll find it an easy process. Not only can you use it everywhere, you can take it anywhere with ease. The straps and anchor take up hardly any room and weigh next to nothing, so you can fold them up and toss them in a bag without worry. By using your body weight against gravity, you’ll quickly gain strength and stamina. As you can push, pull, twist, etc. you’ll be able to cover any and all muscle groups with this convenient little set up. Any fitness level can find benefit in this system, and is very easy on the joints. 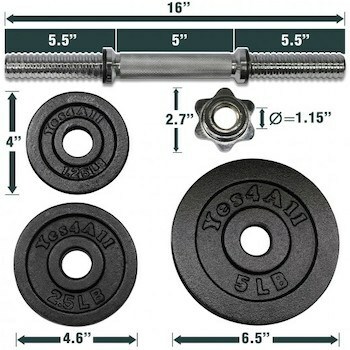 Straps are nice and durable, along with the anchors, and can hold up to 350 pounds safely. While it doesn’t have the weight capacity of some of the other products here, it will work for most. If you were wondering if there’s a way to combine the last few products, the answer is “yes”! The ONNIT Suspension Rings combine rings with straps, to give you a versatile, effective, and heavy-duty system that will work out every part of your body. Set up is quite easy, with the dual mount system which connects different anchor points to use natural lines of force. This allows for safe and more natural movements to avoid injury and to help you increasingly build your strength comfortably. As each strap is marked clearly with numbers, you can easily adjust them in seconds to make for a high-intensity workout. As the rings are made of wood, they’re quite durable, but not ideal for outdoor use. 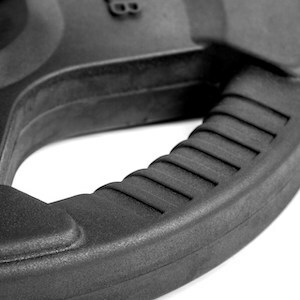 However, the texture is quite grippy to give a secure hold. The straps consist of strong webbing, complete with double stitching to ensure they last for a long time. The strap which traverses the center of the ring makes it so you can even loop your feet under to perform exercises like hip bridges or hamstring curls, however upper body exercises are easier to pull off. If you’re seeking ideas for exercises, check out the array of options they have listed at the ONNIT Academy online! Kettlebells and battle ropes generally fall into the category of conditioning equipment, the purpose of which is to simultaneously build cardiovascular and muscle endurance, as well as muscular strength. In this regard, both of these pieces of equipment are superb, especially where upper body exercises are concerned. Kettlebells are often classed as free weights, but we’re going to give them their own discussion here. That’s because they’re a unique piece of exercise training equipment. For those who are unfamiliar with them, kettlebells are essentially cannonball-shaped, iron spheres with flat bases and handles attached. Their unusual shape and weight distribution allow for a range of exercises that differ from those traditionally done with more ‘standard’ free weights like barbells and dumbbells. Examples include kettlebell swings and one-armed snatches. Multiple studies have looked at the effectiveness of kettlebell training and shown it to be an effective way of improving cardio fitness, as well as muscular strength and power. Bells tend not to be particularly expensive, and for under $200 you can easily pick up a couple of different weights that will allow for varied and challenging upper body workouts. Rogue’s products tend to be the best in the business, there’s no two ways about it. Their ethos as a company is very much centered around producing fitness equipment that meets the highest standards of quality. Most of their manufactured products are also made in the US, which is an integral part of their appeal as a company, at least to American consumers. The trade off to this is that their equipment is usually among the most expensive on the market. Not so with their kettlebells though. Rogue’s standard kettlebells are arguably the best you can buy, but they’re also very competitively priced, even when factoring in shipping. They’re made from top quality cast iron, and have a really nice powder-coated matte black finish. This makes their handles feel smooth and comfortable to hold but still grippy, and thus easy to train with for long periods. The iron is also just right in porousness; it holds chalk extremely well, which further improves the feeling in your hand. Other lower-quality kettlebells often have narrow handles that can be awkward to hold with both hands and require your pinky fingers to be out, which compromises the strength of your grip. However, Rogue’s bells have nice and wide handles that should easily fit even the broadest of hands, and make swings and other two-handed exercises safe and effective. All-in-all, these are great looking, stable kettlebells that will probably outlast you and your children. For under $200, you can pick up any size / weight from 9 lbs – 176 lbs (4 kgs – 80 kgs), and we’re very certain you won’t be disappointed. A quick glance at Onnit’s custom kettlebells can lead to doubt. You may decide to write them off as good-looking gimmicks that aren’t actually functional. But, that’s simply not the case. While their Marvel, Star Wars and Primal kettlebells may well be gimmicky, Onnit has genuinely invested a lot into making them precise, well-finished, and extremely durable. 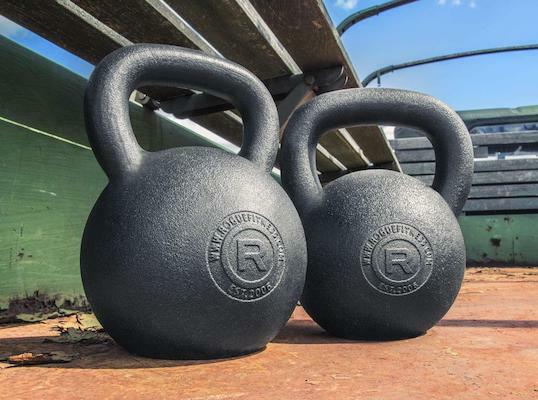 Yes, they’re more expensive than regular kettlebells, and some of that cost is in the custom designs, but rest assured that you’re also getting a top-quality product. They’re extremely well-balanced, and the handle diameter and width is just as good as Rogue’s – they’ll fit your hands (both) and hold your grip well. 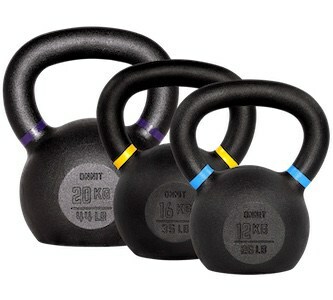 The black finish has a very nice, comfortable feel to it, and will easily stand up to the usual abuse that kettlebells take when used regularly. The back sides are also nice and smooth, which makes them easy on the arms when doing exercises like snatches. Finally, the bases are perfectly flat and make these bells as stable as any other. Apart from the extra cost, the major downside is that the different designs only come in single weights. That means if you want an iron man kettlebell, you must have it at 40 lbs. If you want a heavier bell, but don’t like the design, you’re currently out of luck. If you don’t want to pay the extra cash for something you’re just going to get sweaty with, then consider Onnit’s range of normal kettlebells. They’re just as well made, at a much more reasonable price. We recommend the beginner or moderate packages: They include 3 kettlebells at increasing weight increments, and are perfect for building strength, power, and aerobic capacity in your upper body. A couple of notes: 1) We’ve linked to the men’s packages, but they’re available in women’s packages as well. 2) The men’s moderate package is, at the time of writing, a little more than $200. Battle ropes have become extremely popular training equipment. This is because they provide an efficient and extremely vigorous workout, especially for the upper body. 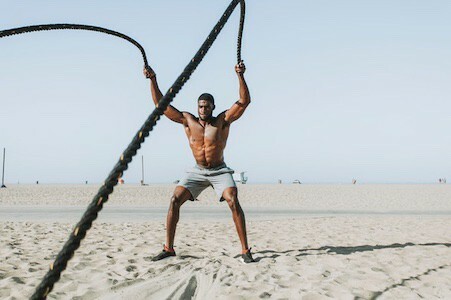 Studies that have looked at training using a battle rope have found them to effectively condition aerobic capacity, muscular endurance and power, and even contribute to improving the shooting accuracy of college basketball players. While they can be cumbersome, battle ropes are also really versatile. They can be used virtually anywhere that has a ground-based anchor, like a post or tree. On top of that, you can get a good-quality rope for well under $200. Therefore, if you don’t mind lugging them around, they’re a great addition to your exercise equipment arsenal. The second iteration of battle ropes from Rep Fitness are easily the best quality and value options currently available. Made from Polydacron (‘polydac’ for short), they’re soft and easy on the hands. They come in a variety of colors, widths and lengths, meaning there’s an option to suit any preference and ability level. The funky range of colors means most people should be able to find a rope that matches their personal style, though admittedly this low down on the list of priorities. As with most battle ropes, the Rep V2s come in either 1.5″ or 2″ diameters. The smaller diameter is easier to grip and manipulate, and more appropriate for people with smaller hands and beginners with lower levels of strength. That said, the larger diameter will challenge your grip and build the muscles of your forearms to a greater degree. Length options are 30′, 40′ and 50′, with the longer ropes being heavier and requiring more strength to use. Again, shorter ropes are more appropriate for beginners, while longer ropes are better for more advanced users who have a better strength base. Ideally, battle ropes hold up best when used on rubber or grass / turf surfaces, especially polydac ropes. Polydac freys really quickly then used on concrete or other particularly rough surfaces. Thankfully, Rep have a released a battle rope that has a complete nylon sleeve, which helps to protect the polydac from wearing out quickly. That said, even the nylon sleeve will quickly start to look average if used on concrete. 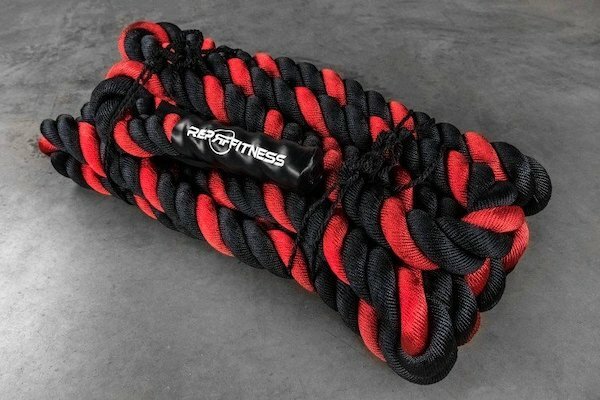 If you’re looking for a brutal upper body workout that will build muscle and cardio fitness simultaneously, definitely consider a Rep battle rope. And there you have it – The Best Upper Body Workout Equipment for Under $200. Pick up any of the above recommendations and you’ll be well on your way to developing a fit, strong and healthy top half while keeping your bank account in good shape too.